Three Wonderful Days in Freeport! Recently several guests have stayed with us and visited Freeport for the first time. They have all had similar reactions. The first reaction is “Wow! We didn’t know there was so much Freeport shopping!” You see, not being from the northern New England area, they were unfamiliar with Freeport, and many had no idea that it was the home of L.L. Bean. The second reaction, for all of them, was, “We had no idea there was so much to do within a short drive of Freeport! What a great location to base our stay, so we can take day trips to see lighthouses, visit lobster shacks, beaches, etc.” They had no idea what a perfect location Freeport is for sightseeing. We’ve decided to make Freeport a little more accessible for our guests by setting up our Fall Freedom package, with 3 nights for the price of 2! This provides the ideal opportunity to see the rugged Maine coast, visit lighthouses (there are at least a dozen within about an hour and a half drive of us), hike along the water or in the hills in our state parks, and more. Or, if you prefer, take a hike through Freeport and visit the 5 L.L. Bean stores (four of them never close!) 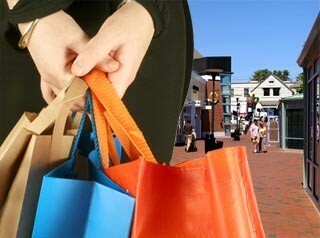 and over 150 other shops and restaurants, all within a few blocks of us! Explore Kennebunkport and/or Kittery and/or Ogunquit, etc. One last shopping trip before checking out. Bid goodbye to your new friends, and promise to return soon! When will we see you here?